Do you love to hike over fast trails and slick terrain? Does your dog love to track deer and retrieve birds? Do you bring your dog but notice him limping after only a short period of time? These dog hiking boots help prevent abrasions from rocks, thorns, broken glass and other rough terrain while hiking in the great outdoors. This is a time for working dogs to don their hunting boots and hit the woods and lakes and help their masters track deer or retrieve birds. As a hunter, you take your dog with you through rugged conditions like grassy areas full of burrs, mud, and rocks. A sturdy pair of dog boots will keep paws protected from injury and allow your partner to take off like a rocket over whatever terrain you find yourselves in. 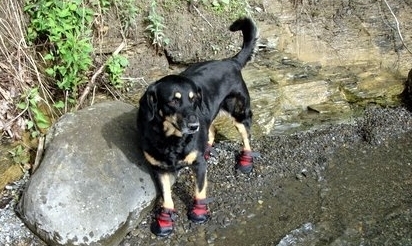 Why does your dog need hiking and hunting boots? It’s times like this during Fall season when retrievers finally get to retrieve something other than balls and frisbees. After all, years of breeding built these dogs to chase down and bring back that duck that dad so expertly shot out of the sky. As a hunter, you take your dog with you through rugged hunting conditions like grassy areas full of burrs, mud, and rocks. 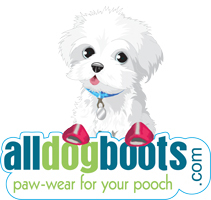 A sturdy pair of extreme dog boots or hunting boots for dogs will keep this paws protected from injury and cushion them from flow to their legs and paws. While you tromp through the brush and woods for the manly pursuit of hunting, your dog is at your side doing what he or she was bred to do. If he is outfitted with good hunting dog boots or working dog boots specifically made for hunting, your dog will be able to move fast when the time comes, stop and turn quickly, and take off like a rocket over whatever terrain you and your companion find yourself in. You want your dog to work for you while at the same time keeping him and those paws in good shape so that when he is “off duty” he can still romp and play and go back to just being your pal.